President Donald Trump’s tax law resulted in a bump in take-home pay for about 90% of Americans, according to the IRS. For people earning $US75,000 a year, federal income and FICA taxes amount to $US685 per pay period under the new tax law, down from $US778. That means employees who make $US75,000 got a $US93 boost per bimonthly paycheck. Starting back in February, many Americans saw a bump in their take-home pay thanks to President Donald Trump’s new tax law. The new law changed the 2018 tax brackets and went into effect starting this year. The IRS released new guidelines in January, known as tax-withholding tables, that tell employers how much to take out of employees’ paychecks for income taxes based on criteria such as single or joint filing status, Business Insider’s Bob Bryan reported. That amount is paid to the IRS in the employee’s name. At the end of the year, when an employee files their taxes, they either get a refund (if too much was withheld) or pay more (if too little was withheld). 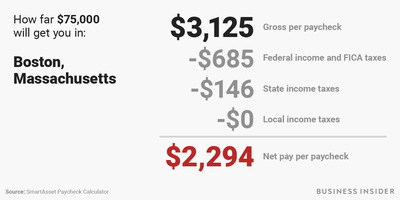 The new withholding changes hit Americans’ paychecks around February 1, resulting in roughly 90% of workers getting higher take-home pay, according to the IRS. 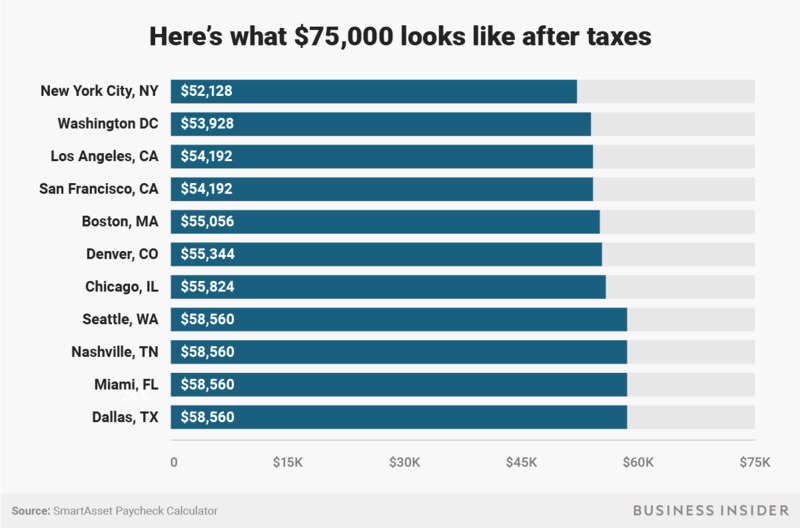 In light of the recent change to the tax law, we used SmartAsset’s paycheck calculator to find out what $US75,000 looks like after taxes in 11 US cities. 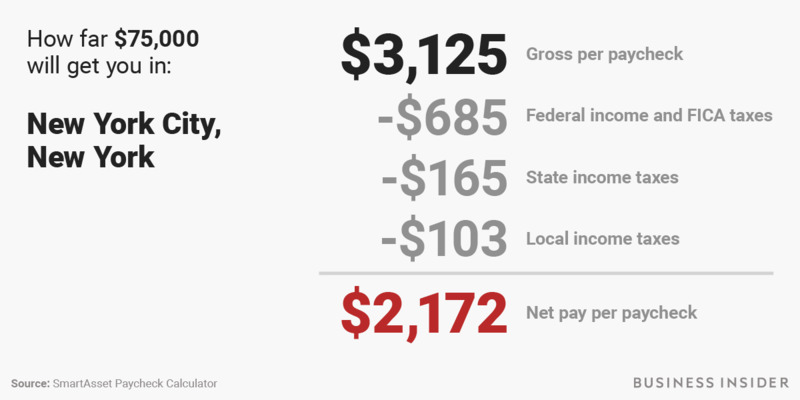 The chart below shows annual take-home pay in each city for 2018. 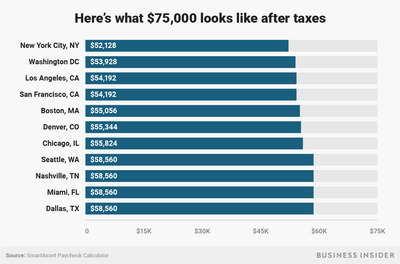 Some states – like Washington, Florida, and Texas – don’t have state income taxes, so someone who earns $US75,000 there will bring home a bigger paycheck than someone who lives in California or New York. These take-home pay estimates account only for state and local income taxes, which vary by place, plus federal income taxes and Social Security and Medicare (known as FICA). For a $US75,000 earner in 2018, federal and FICA taxes amount to $US685 per pay period no matter where in the US you live. Before the new tax law, federal income and FICA taxes took $US778 from every paycheck. If you’re contributing to a tax-advantaged retirement account, like a 401(k), the paycheck you bring home will be less than these figures. 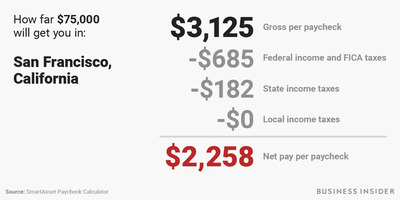 But in that case, your savings are covered – or at least part of the recommended 20% of your paycheck you should earmark for savings and paying off debt – and the rest of your paycheck can go toward necessities like housing, food, transportation, and discretionary spending. 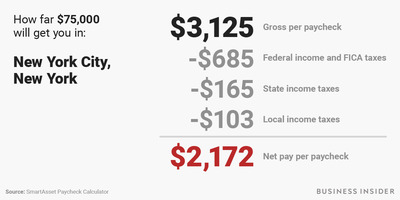 The same goes for health insurance, if you’re enrolled in a healthcare program through your employer, which will deduct monthly insurance payments from your paycheck on a pretax basis. New York City residents fared the worst in our city comparison. 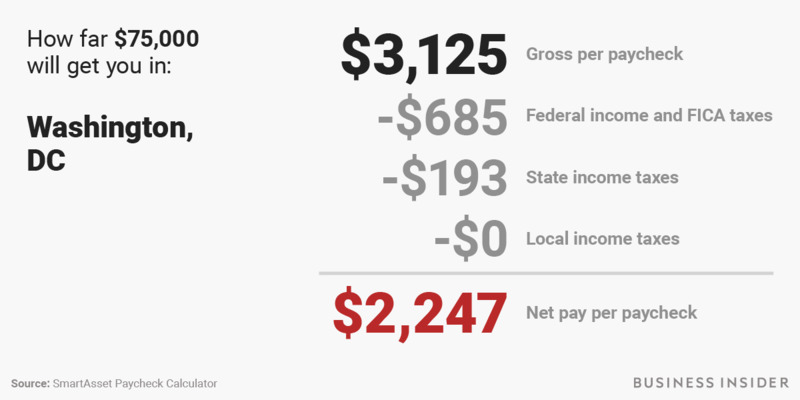 Employees in the city take home just over $US52,000 on a $US75,000 salary, largely thanks to steep state and city income taxes. 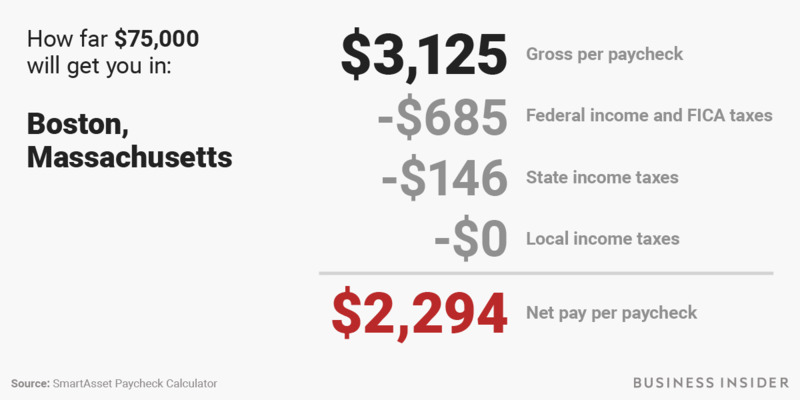 That doesn’t leave much to cover housing or transportation costs in the most expensive city in the country – but it is slightly more take-home pay than they received before the GOP tax law. 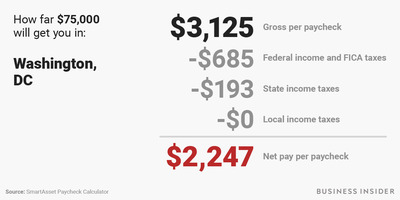 Below, check out the twice-monthly-paycheck breakdown for workers earning $US75,000 in 11 US cities.